People underestimate how much power an audience has over our enjoyment at a concert. On the one hand, some shows need a young, high energy group of young people to really get things going. On the other hand, immature audience members often fail to appreciate the nuances of excellent musicianship, less-popular genres of music (like most “classical” works), and the heritage that all of our current musicians share with others around the globe. 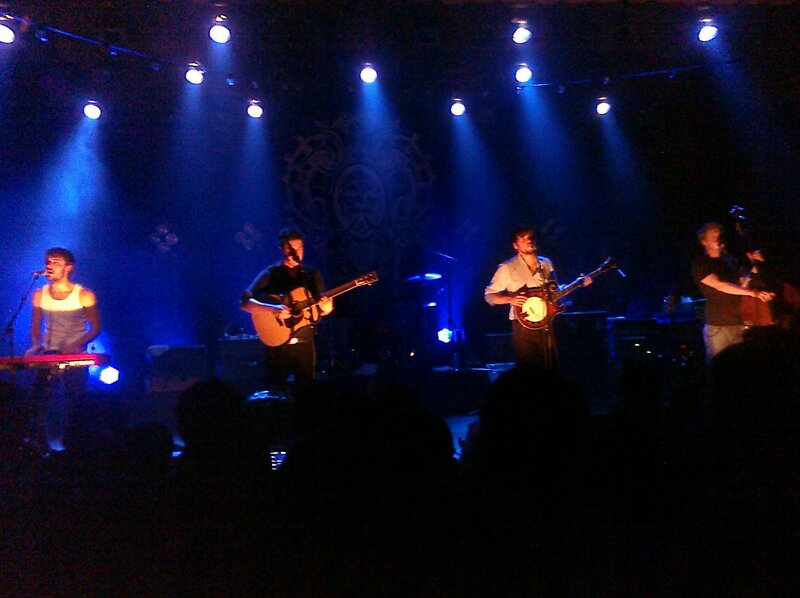 I was surprised Sunday to walk into the Buckhead Theater in Atlanta and find a crowd of yuppies and college students and middle aged people waiting eagerly to hear British folk-rock-bluegrass band Mumford & Sons. It was truly an interesting mix of very polite, very excited fans of the good looking quartet with their lovely collection of traditional instruments (and the banjolin). We’ve been listening to their CD almost non-stop in our household as soon as I got it in July, but most of the people at the show could top that: They could sing pretty much every word of every song! Mumford & Sons brings a gravitas to their performance that few 20-somethings can ever dream of marshalling even when they add a few more years to the pile. Lead singer Marcus Mumford offers up his soul on the back of his guitar for each song, staring down the crowd and forcing people to come to terms with their lyrics — which are rich and deep and reflective. Every man threw himself into the performance, whether Ben rocking out the keyboard or accordion, or Winston on the banjo/banjolin, or Ted beautifully handling the tall double-bass. But what made the show incredible — truly an experience — was the audience. You can’t mask an audience’s passion for an artist, not the screaming teenie-bopper attention that big-name pop stars earn, but a deep, fierce loyalty a music-lover can have for his/her favorite musicians. Bring those musicians and those fans into the same room, and you’ll have magic. And the Buckhead Theater was a charmed venue on Sunday night. Every album track the band played — and I believe they played them all — was thundered back at them by the audience. Even a couple of the 4 new songs had already been leaked to the Internet, and the guys standing behind us were singing every word. Marcus smirked with satisfaction late in their set when he was finally able to find a song the audience didn’t know…. but we loved it anyway. The band mates would make eye contact with each other and laugh as if to say, “What is going ON?! We’re in Georgia! How do these people know this music so well!” They powwowed in tight little sweaty conferences at the back of the stage, probably mumbling stuff like Hey, maybe we should throw in this one too? 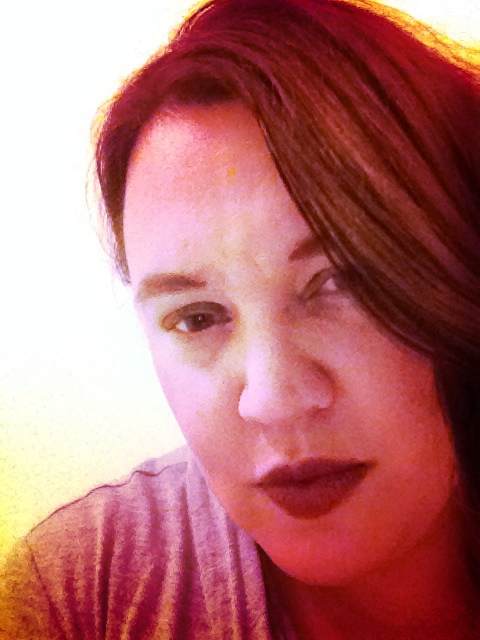 … and then it would happen. When you can watch four friends doing what they love and loving every minute of it, no one in the audience was willing to let them off the stage until we’d heard every recorded track and then some. I’d be remiss not to mention opening bluegrass band Cadillac Sky in my review. They were outstanding musicians. I’ve never seen someone “shred” on a banjo …. but I did last night! The lead violin player was amazing, though the crowd didn’t give him nearly enough applause for his talent. The guitar player was crazy and did things with an acoustic guitar that shouldn’t be possible. The double-bass guy was JAMMIN’. I think the group brought 6 or 7 people to the stage for their set, which was a lot of fun. Definitely a show well-worth the ticket price (and extra Ticketmaster service fees). I have a feeling Mumford & Sons will be back among us next year. They won’t forget to visit their new “favorite crowd ever” (Ben’s words). If you haven’t heard the album, I highly recommend finding some tracks on YouTube or MySpace and giving them a listen . . . I didn’t feel like I could take photos at a “formal” concert, so you’ll have to make do with the program instead. 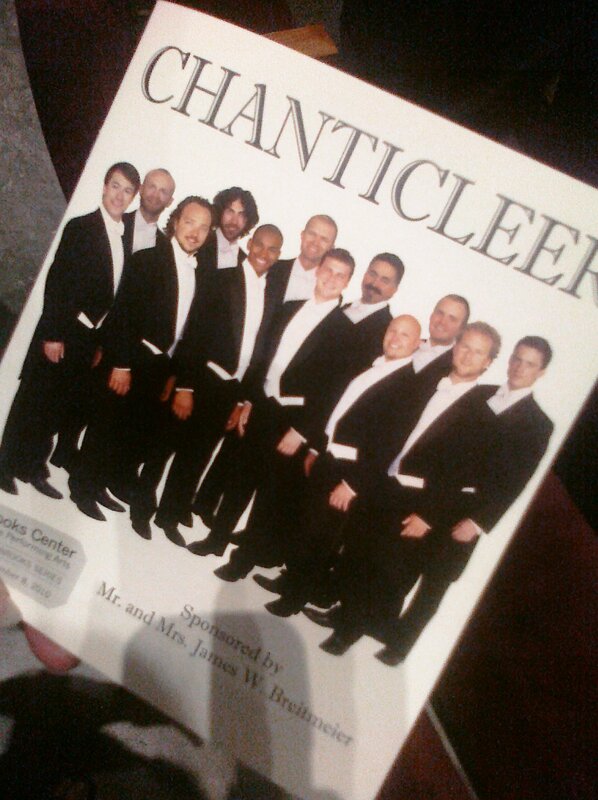 Switching gears completely, Coart & I found ourselves at the Clemson University Brooks Center tonight on row B enjoying 12-man-wonder-singers Chanticleer. We’ve been Chanticleer fans for more than a decade now, chasing them to various local cities when we’re lucky enough to have them close by. My favorite venue for an a capella performance is the hall up at Brevard College — perfect acoustics! But Brooks is a good performance space too, and I heard every glorious note of tonight’s program. What do you get when you assemble 12 of the finest vocalists on the planet? Twelve guys who can sing anything from medieval chant to Italian madrigals to Schumann lieder to 20th C experimental music, R&B, gospel, and jazz. These concerts provide such a variety of musical material — I’m always fascinated! Tonight’s “special” or unusual selections were very interesting. One, “Observer from the Magellanic Cloud” suggested the sounds of a future satellite traveling in the nearby galaxy we call the Magellan Cloud, catching a whiff of a signal from Earth of the Maori people in New Zealand dancing their tribal dance in honor of those stars (which they believe bring them crops & a good growing season). The piece slowly changed from a vocalization of something that would suit a sci-fi movie soundtrack into a Maori tribal dance/chant … and then swirled together as the two “signals” became one. Even more amazing was a set of pieces by an Australian composer, I’ll have to look at my program to find her name, who was haunted by aboriginal melodies and sounds. One piece was mostly harmonic overtones — the singers used their mouths to create a variety of precisely pitched sounds which, taken together, started to “shimmer” throughout the room in overtones. High pitched harmonies seemed to coalesce from the very air, conjured by the magic of physics/acoustics and the human voice. I was truly stunned. Not an electronic instrument (or any instrument) in sight except the human voice and some incredible vocal training. Do yourself a favor: Find some Chanticleer for your Christmas (or world/follk/classical) CD collection. Look up videos/clips of Chanticleer singing Francis Biehl’s “Ave Maria,” or the Vaughn Williams arrangement of “Loch Lomond.” Those are both gut-wrenchingly gorgeous. I guess that’s the end of our concert budget for a while. At least we wrapped up 2010’s season with an unforgettable 24 hours.